If you're looking to start your own audio editing service, or just want to make your show sound better. This course is for you. Last week we looked at what is Imposter syndrome, and how to overcome it. I was listening to the Dennis Miller Option and he shared some insights into how he feels when he is at a party with “celebrities.” If you are new to Dennis Miller, here are some facts from his Wikipedia page. He also had shows on CNBC, and has done featured spots on many television shows. This is paraphrased from this show, ” As far as being a celebrity, I'm complete “wobbliness.” The moment I'm with some people who are famous I can do my little patter. I can make them laugh, and we can have the exchange that they want to have and I want to have. At the end (of the night), if they say, “Here is my number call me,” when I get home and I'm alone, I don't tare it up, I keep them and think I'll call them someday. 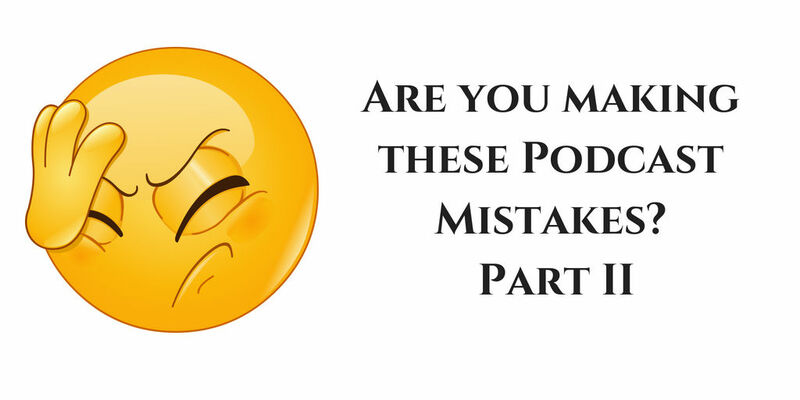 Are you ONLY putting a “jukebox” or “show player” for your podcast? This makes it easy to go to one page and click listen and let it play all of your episodes. Ther are now show notes on your page. Any shows notes that appear are actually on your media hosts website (and the player is served in what is called an iframe, so technically while this appears on your site, it's like someone cut a hole in your site and you are looking through to the original site). Do You Have Extra Words In Your Podcast Name That Are Not Needed in Apple? In this example, I'm not talking about the title of your episodes but the title of your show. Try to avoid having people “Search for the show in Apple podcasts.” If you do, you need to tell them EXACTLY what to search for. The kookcast is a podcast with a very unique name. I would deeply doubt there are two shows with that name. If you go to Apple podcasts and search for kookcast it comes right up. However, if you enter “The kookcast” even with its SUPER UNIQUE name it does not appear in the top 300 results. From what I can see when you add “The” your show is ranked against all the other shows that have the word “the” in the title and it doesn't appear. So in your case, you might need to have them search for your name instead of the name of your show. This assumes you are listed as the author of your show. Is Your Podcast Created by Unkown? If you search for your show in Apple podcasts and it shows the author as “unknown” you can easily fix this by going to the system you use to make your show (for example in Libsyn.com you can go to destinations > edit > Libsyn classic feed and add the author information along with owner, email, categories) and enter the missing information. The listing in Apple should be updated in about 24 hours. Do You Not Care About Your Android Audience? This one confuses me, but I see it all the time. I go to a podcast website, I see the show. I can click play. When I go to subscribe there is one and only one option. Apple Podcasts. If you are on android, you are out of luck, I hope you figure something out.